Hola Amigas! It's NEVER too early to start ordering your Holiday Greeting Cards from ME! Or learn the creative art of stamping and make them yourself. 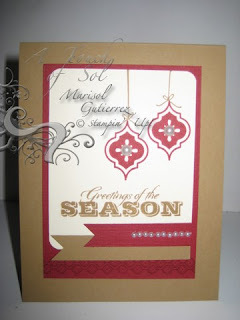 I love the versatility of the stamp set Mosaic Madness. I cased this from another demo.I changed the greeting and the colors but mostly stuck to the GREAT artwork of her card. What do you think? Hola Amigas. 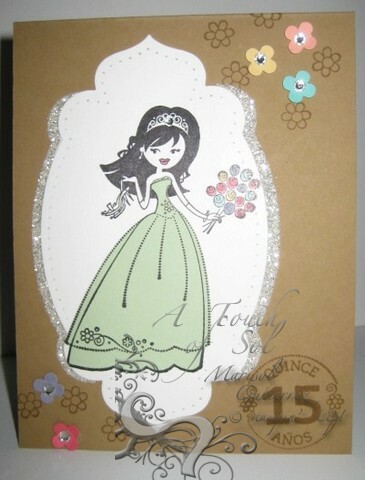 I have the pleasure of making Quinceañera invites for a client. This is one of the samples I presented her. This is also one of the samples not chosen. I love this stamp set. It can be used for Quinceañeras, Sweet 16 and Bridal Showers. In this sample I paper pieced the dress in Pistachio Pudding. What do you think? I also wanted to remind you that our 13th SUDSOL Blog Tour is September 11. We will be showcasing artwork using products from the Holiday Catalog. You do not have to be a member of SUDSOL to tour the blog but if you would like a FREE 2 week trial. Please click on the banner below.